In February 2018 we spent ten days in Oaxaca, studying Spanish, making new friends, learning about Oaxaca and, of course, enjoying Oaxacian cuisine and mescal. We really can’t recommend this trip enough. Weather in Oaxaca – November – March is cool and dry. April & May are hot. May- October is the rainy season. Our crew – The best part of the trip was all the people we met. The breakfast club – Mark, Gail & Ron with whom we shared breakfast and great conversation each morning in the courtyard of our airbnb Out classmates, Muriel, from Montreal, who became hermana de Susanna, Rosie, a young woman from London, and Amr, an Egyptian civil engineer, immigrated to Boston. Over the week we shared our life stories, acted out dramas in class and talked among ourselves, in Spanish and English and Quibecois. 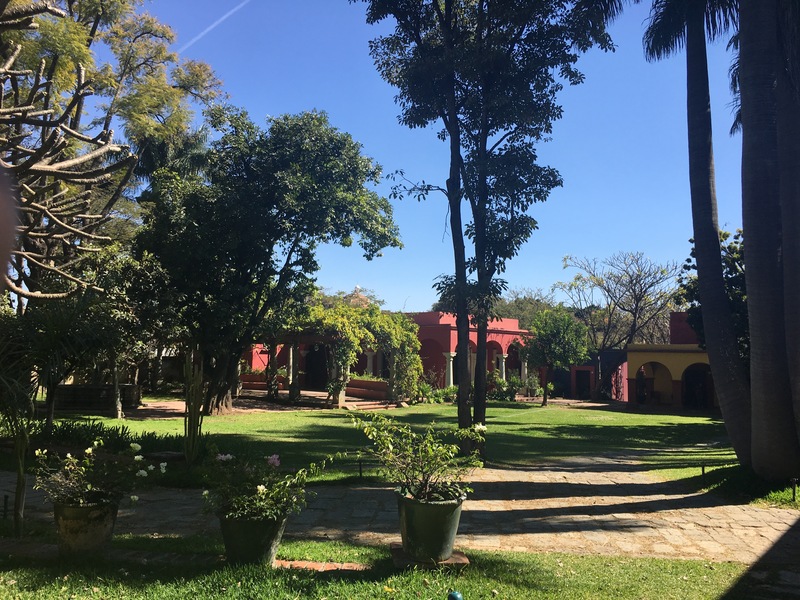 We studied at the Instituto Cultural de Oaxaca housed in a beauriful landscaped campus just outside the central district. Neither of us spoke much Spanish. We had “mas cerveza y donde es el baño” down cold and have navigated travel in Spain. We used our Michele Thomas language CD’s and DuoLinguo, a free online language course. That preparation was enormously helpful and we were spared having to be exiled to the very lowest level class. Our classes were excellent. A group of five well matched in skill level. Our teacher, was patient and easily improvised from the curriculum. At the end of each morning, we sat in the garden conversing in Spanish, consolidating what we had learned that day. There’s an option, to live in a home stay so that you were immersed in Spanish all the time. Jardín Ethobotánico de Oaxaca – In the 16th century the Dominicans built a monastery next to the Temple Santo Domingo. President Bonito Juarez, a Oaxacan, nationalized church property in 1872. Until 1993 the Dominican buildings and the adjacent was military fort. The government had planned to convert the site into a convention hotel and parking lot. But famed artist Francisco Toledo and other Oaxacans resisted, and in the end won the day converting the monastery into a museum and library and an extraordinary ethobotanical garden that links the 10,000 year old human and plant history of the Oaxacan region. We were fortunate to have the founding director, Alejandro de Avila, as our tour guide. We couldn’t help but be inspired by the passion and enthusiasm for his mission to use the gardens to explain and confront the subjugation of the precolonial people and, at least in some small way, undo the damage, through education and political and legal action. He’s the angriest botanist I have even encountered. You cannot wander but must take the tour. There is only one English tour each day and they last two hours. The valley of Oaxaca, actually a series of interconnected valleys is surrounded on all sides by high rugged mountains. It seems physically and emotionally cut off from the rest of Mexico. 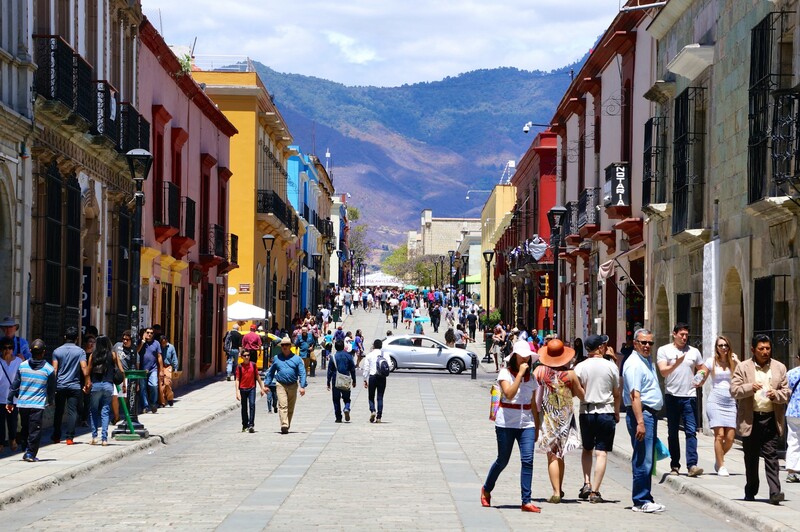 Oaxaca is the center with dozens of small separate towns throughout the valley. Each pueblo has its own nature, culture and often language, The Oaxacans are fiercely proud of their city and the surrounding pueblos. While many of the wealthy are decedents of the Spanish and French colonizers, many of the people that one encounters every day are decedents of the Zapotecs or one of the other first nations communities. There are at least 16 languages spoken in the valley as a first language in their communities. Not so far under a calm exterior, there remains a generational anger at the Spanish and French colonizers with a sense of underlying pride and patience that the first nation cultures will remain and flourish, perhaps after the Spanish legacy fades. After all, the Zapotec culture was dominant for 500 years and even though it was eclipsed by the Spanish the culture it has endured for another 500 years, experiencing something of a reinassance in the ethnic arts of the community. En Via – This is a tour not to be missed. En Via is a non-profit micro- lending group that provides direct support to local women artisans of all sorts but primarily weavers. The tour, while more expensive than the mediocre commercial tours is actually the source of their lending fund. We were welcomed into a Oaxaca that most tourists are not often lucky enough to visit, exploring outlying villages and meeting met women artists in their homes. On our trip, we ended at the home of a weaver on a distant mountain top. Monte Alban – Monte Alban is a vast temple complex at its height for almost 900 years until it was mysteriously abandoned in the 8thcentury. You can hire a private car that will take you there, wait and bring you back for a reasonable amount. Hire one the English speaking guides, you can design your own tour. Ours took us on a unique route through the vast temple, discussing the history and the spiritual basis of that ancient culture that still persist today and a little of his own personal history. Restaurants – Here are a few places from our first visit. La Biznaga – Locals keep referring this even with their warning, good food at a good price but the service isn’t so hot. Don’t be in a hurry and you’ll enjoy it. Zandunga – Restaurant and Mezcal bar pretty room, relaxed and good food. Have the green or black mole. Los Danzantes – Sophisticated and interesting. Beautiful room. A little more expensive than the previous two. 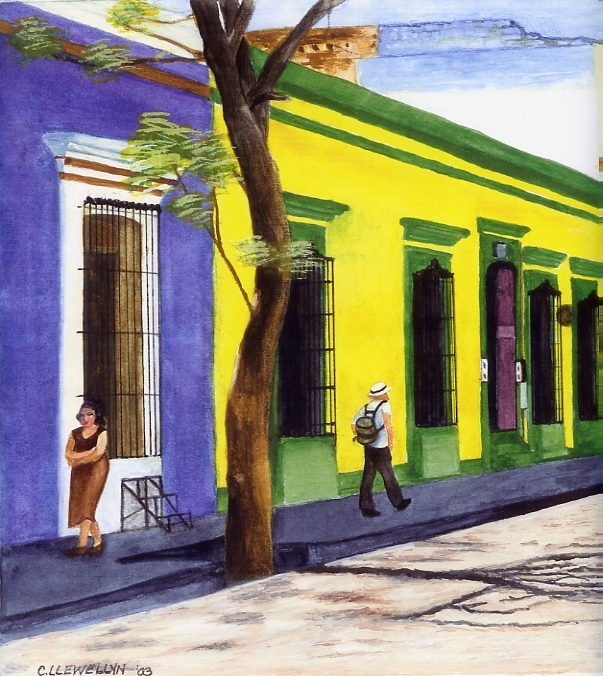 El estaurante Casa Oaxaca – May be the most expensive place in Oaxaca but that’s relative. We tried pretty hard and it was almost $100 for two including drinks and tip. Beauitiful rooftop terrace for late evening dinner. In December of 2018 we made a brief five day return trip to clebrate Susan’s birthday. This time no Spanish classes, just relaxing and enjoying the city. Casa Oaxaca – In celebration we stayed at the Casa Oaxaca, just a few blocks from the Temple de Santo Domingo in the middle of the city. Casa Oaxaca is a very small, nine, room hotel, that occupies a 15th century building that until 20 years ago had been a private home. It has an unassuming facade, with hardly a sign that we have passed by without noticing before. Passing through the front door you find a the building arragnge around a large courtyard. Our room was one of the suites, wonderful with a view to the west over the pool and the sunset. The accommodation and service are really first class. They serve a very nice breakfast on the courtyard each morning and also have a very good quite restaurant.